Flanked by staff and veterans, Ontario Command President Sharon McKeown (centre) joins members of Wounded Warriors at the launch of a partnership to expand the PTSD Service Dogs Program in Ontario for ill and injured veterans and their families. 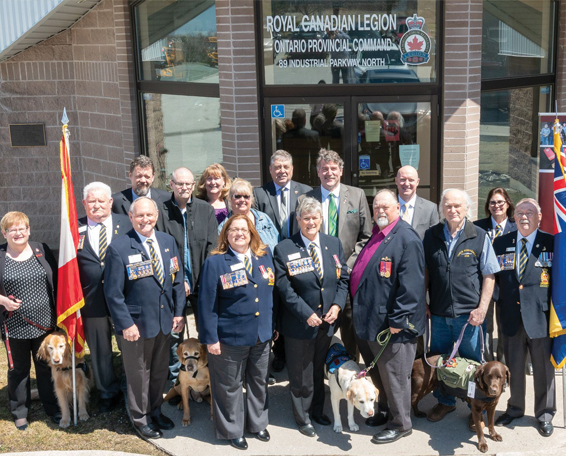 Wounded Warriors Canada’s PTSD Service Dog Program has expanded into Ontario with the help of a $225,000 donation from Ontario Command of the Legion. The money will fund 10 PTSD service dogs which will be paired with ill or injured veterans and their families. The move comes after the Canadian General Standards Board announced that it has withdrawn its intention to produce national standards for service dogs. Since the announcement, Veterans Affairs Canada has said it will take on responsibility for developing standards (“VAC moves to set standards for service dogs,” July/August). In 2015, Ontario Command placed a moratorium on the use of poppy funds for service dogs until Canadian national standards were developed. WWC’s PTSD Service Dog Program is a national program to increase the number of properly trained service dogs for ill or injured veterans. In 2018, it plans to pair 25 service dogs, which is a funding commitment of $300,000.